From Middle English hamer, from Old English hamor, from Proto-Germanic *hamaraz (compare West Frisian hammer, Low German Hamer, Dutch hamer, German Hammer, Danish hammer, Swedish hammare). The Germanic *hamaraz "tool with a stone head" derives from Proto-Indo-European *h₂eḱmoros (compare Sanskrit अश्मर (aśmará, “stony”)), itself a derivation from *h₂éḱmō (“stone”). For *h₂éḱmō (“stone”), compare Lithuanian akmuõ, Russian камень (kamenʹ), Serbo-Croatian kamēn, Albanian kmesë (“sickle”), Ancient Greek ἄκμων (ákmōn, “meteor rock, anvil”), Avestan 𐬥𐬀𐬨𐬯𐬀‎ (asman), Sanskrit अश्मन् (áśman)) (root *h₂eḱ- (“sharp”)). 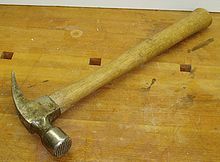 A tool with a heavy head and a handle used for pounding. A moving part of a firearm that strikes the firing pin to discharge a gun. (anatomy) The malleus, a small bone of the middle ear. (music) In a piano or dulcimer, a piece of wood covered in felt that strikes the string. (sports) A device made of a heavy steel ball attached to a length of wire, and used for throwing. (curling) The last stone in an end. (Ultimate Frisbee) A frisbee throwing style in which the disc is held upside-down with a forehand grip and thrown above the head. Part of a clock that strikes upon a bell to indicate the hour. One who, or that which, smites or shatters. St. Augustine was the hammer of heresies. He met the stern legionaries [of Rome] who had been the massive iron hammers of the whole earth. To strike repeatedly with a hammer, some other implement, the fist, etc. (figuratively) To emphasize a point repeatedly. (sports) To hit particularly hard. This time the defender was teed up by Andrew Johnson's short free-kick on the edge of the box and Baird hammered his low drive beyond Begovic's outstretched left arm and into the bottom corner, doubling his goal tally for the season and stunning the home crowd. (cycling, intransitive, slang) To ride very fast. Fifteen minutes later, leaving a vapour trail of kitchen smells, I hammered into Obterre. (intransitive) To strike internally, as if hit by a hammer. I could hear the engine’s valves hammering once the timing rod was thrown. (transitive, slang, computing) To make high demands on (a system or service). From Old Norse hamarr, from Proto-Germanic *hamaraz, from Proto-Indo-European *h₂eḱmoros, from *h₂éḱmō (“stone”). (colloquial, regional) Contraction of haben wir. Da hammer jetz' keine Zeit für. We don't have time for that now. This contraction is common throughout central Germany, southern Germany, and Austria. It is only occasionally heard in northern Germany. “hammer” in The Bokmål Dictionary. From Old Frisian hamar, from Proto-Germanic *hamaraz, from Proto-Indo-European *h₂eḱmoros, from *h₂éḱmō (“stone”).